Last week, the International Monetary Fund released an update to the October 2016 issue of the World Economic Outlook. The update revises sub-Saharan Africa’s growth prediction from 2.9 percent to 2.8 percent, indicating that the recovery may not be as substantial as originally expected. Oil exporters, notably, are taking longer to recover, as oil prices reached a 10-year low in 2016. For more on oil-exporters’ particular challenges, see the first chapter of Foresight Africa 2017, which focuses on the need for African countries to mobilize financial resources in the aim to manage the commodity slump and attract investment. As Amadou Sy highlights in the chapter, one means through which African countries can raise revenue is the tapping of the international debt market. Ghana for example, raised $750 million at yield of 9.25 percent in 2016. The eurobond was more than five times oversubscribed, as the country received orders surpassing $4 billion, indicating a “high appetite for Ghana’s credit” as stated by its ministry of finance. Conversely, 2016 brought along several credit downgrades, thus affecting African countries’ ability to access international debt markets. 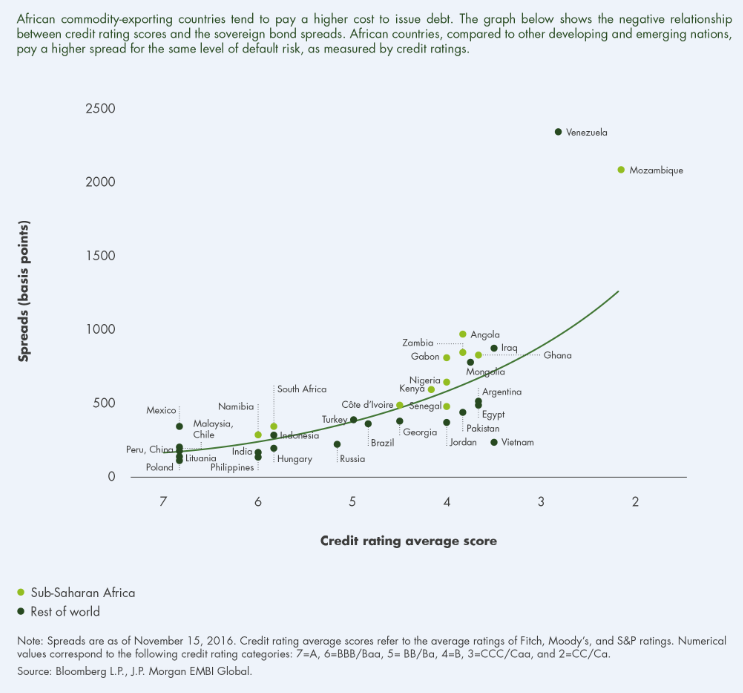 In addition, African countries—notably oil exporters—face higher costs to service their debts than warranted by their credit ratings. The figure below indicates that credit ratings are negatively associated with sovereign bond spreads. High spreads are indicative of a high default risk. African countries pay a premium relative to countries in other regions. For example, Angola and Argentina have comparable credit rating scores, but Angola’s sovereign spreads are almost double that of Argentina (964 against 505 basis points). The graph also shows that this disparity exists within African countries, with oil-exporters facing higher bond spreads than non-oil exporters. The graph shows two distinct examples: Angola has a higher sovereign spread than Zambia, and Nigeria and Gabon have higher sovereign spreads than Senegal, despite their similar credit rating scores. Nigeria currently aims to finalize the sale of $1 billion in bonds by the end of March. Despite Nigeria’s present macroeconomic woes, investors, seeking higher returns during the present low interest-rate environment, are eager to buy Nigeria’s dollar bonds.